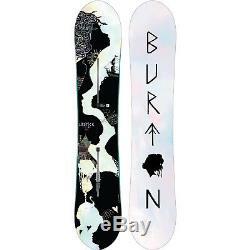 WOMENS BURTON LIPSTICK ALL-MOUNTAIN PARK TWIN TIP "DEMO" SNOWBOARD 149CM. 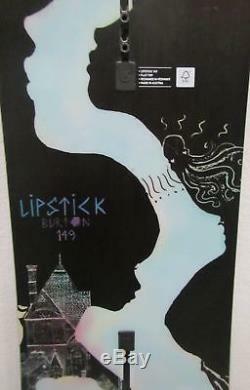 WOMENS BURTON LIPSTICK ALL-MOUNTAIN "DEMO" SNOWBOARD 149CM (SEE ATTACHED PHOTOS). THIS IS A DEMO SNOWBOARD ALL SALES ARE FINAL. Versatility is the name of the game for the all-mountain. From slack-country to park, this board is ready to charge. It features twin tips, medium flex and a flat-top profile. Fairly forgiving and surprisingly intuitive, the Lipstick is a great versatile ride that instigates progression for every level of rider. This board promises a stable ride in any conditions from park to powder to parking lot. If you consider the whole mountain as your terrain park, then girl, have we got a board for you. The Burton Lip-Stick Snowboard is all that and a bag of veggie chips, with its smooth poppy flex and easy catch-free edges. Boasting a twin design with Pro-Tip shaping for easy spinning, along with a progressive Super Fly II core, the Burton Lip-Stick Snowboard was designed to ride the whole mountain with an eye on both natural and man-made features. A flat profile overall with subtle rocker rise provides an extra stable platform underfoot with a catch-free feel at the tip and tail. Having a twin flex indicates that your board is perfectly symmetrical in flexibility from tip to tail so you gain a more balanced and predictable ride. Riders who use the entire mountain as their playground will benefit from this playful, versatile and damp flex. A true twin snowboard shape is ideal for riders who want to ride switch and do some tricks. The nose and tail are identical and the flex is evenly distributed throughout the entirety of the board. True twins are perfectly symmetrical. A tapered tip and tail thickness reduces swing weight for easier mobility. FSC Certified Super Fly II 700G Core. Stronger and lighter woods target specific areas of the core to provide pop, strength, and reduced weight. Burton's most versatile Squeezebox profile improves pop and performance through the balance of thicker, more powerful core sections with thinner, more flexible sections. Rider energy is transferred outward from beneath the feet, energizing the tip and tail while making the board snappier, more stable and easier to manipulate. The wood grain is positioned along the toe and heel edges on two continuous zones, perpendicular to the rest of the wood core for consistent edge-hold and added strength. Versatile flex and response for everything from mini to mega shred. Infusing a specially formulated wax deep into the pores of this extra-absorbent, high-density sintered material results in an ultra-durable base that stays wide open all season and in any condition. Introduced by Burton long before all the hype about wavy "serated knife" edges, Frostbite extends out slightly beneath your bindings for tremendous edge-hold on hard, icy conditions. Powerful when you need them, playful when you don't, Frostbite Edges are hungry for hard-pack while remaining smooth, slowing, and forgiving. This patented design lengthens the surface area at the tip and tail contact points to improve edge-hold and allow the board to plane easier in pow. Enjoy a livelier feel and enhanced grip on groomers along with added float for overhead days. A resin formulated with bio-based materials that reduces the carbon footprint by 50% over conventional all-petroleum-based epoxies. Less oil consumption means even less of a carbon footprint per board. This Burton-exclusive technology allows maximized pop and strength by overbuilding the board, then putting it in a machine that breaks in the board for you. Whether you choose to ride Flat Top, Flying V, or Camber, rest assured that with Infinite Ride your board will maintain its flex, pop, and feel from the first day forward, season after season. Stronger, faster, easier, and more adjustable -- The Channel gives you ultimate control of your stance and your board in a design compatible with all major bindings (not just Burton's). Performance Products Warehouse (PPW) is an online retailer of ON SNOW, ON ROAD, and OFF ROAD parts. We strive to offer a large selection of items no matter what season it is. We personally test our products, so we can recommend the best parts and products for our customers. With our highly competitive prices and exceptional service, you are sure to be pleased with the products and knowledge that you receive from Performance Products Warehouse. Our ultimate goal is to continually provide the best pricing, service, and product information to our customers. Problems with order: Please inspect merchandise at the time of receipt. Any problems must be reported within 48 hours of receipt. All claims for shortages must be made within 48 hours of receipt also. As our customer, we assume that you expect nothing less than a positive 5-star experience from our company and that is exactly what we strive to provide. Listing and template services provided by inkFrog. The item "WOMENS BURTON LIPSTICK ALL-MOUNTAIN PARK TWIN TIP DEMO SNOWBOARD 149CM" is in sale since Sunday, November 4, 2018. This item is in the category "Sporting Goods\Winter Sports\Snowboarding\Snowboards". The seller is "performancesportswarehouse" and is located in Dumont, Colorado. This item can be shipped to United States, Canada, United Kingdom, Denmark, Romania, Slovakia, Bulgaria, Czech republic, Finland, Hungary, Latvia, Lithuania, Malta, Estonia, Australia, Greece, Portugal, Cyprus, Slovenia, Japan, Sweden, South Korea, Indonesia, Taiwan, Thailand, Belgium, France, Hong Kong, Ireland, Netherlands, Poland, Spain, Italy, Germany, Austria, Israel, Mexico, New Zealand, Philippines, Singapore, Switzerland, Norway, Saudi arabia, Ukraine, United arab emirates, Qatar, Kuwait, Bahrain, Croatia, Malaysia, Chile, Colombia, Costa rica, Panama, Trinidad and tobago, Guatemala, Honduras, Jamaica.